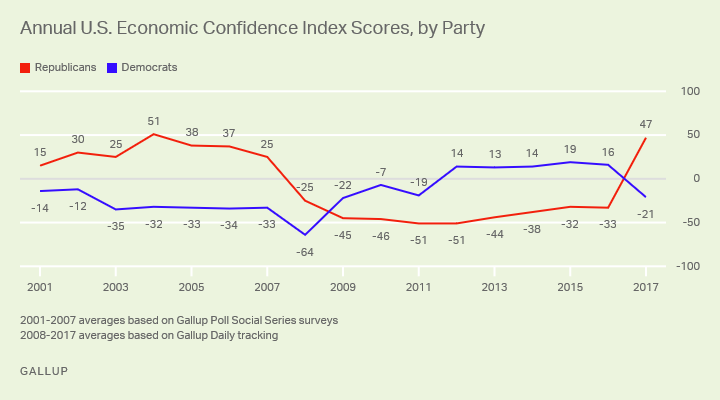 WASHINGTON, D.C. -- Republicans' and Democrats' views of the U.S. economy, as measured in the Gallup Economic Confidence Index (ECI), diverged more in 2017 than they have in several years. Last year's average 68-point gap between Republicans' and Democrats' ECI scores roughly matches the gap seen in 2012, and before that in 2005 and 2006. Gallup's U.S. Economic Confidence Index is the average of two components: how Americans rate current economic conditions and whether they feel the U.S. economy is improving or getting worse. The index has a theoretical maximum of +100 if all Americans were to say the economy is doing well and improving, and a theoretical minimum of -100 if all were to say the economy is doing poorly and getting worse. Gallup measured economic confidence in monthly polls from 2001 to 2007, and in daily tracking from 2008 to 2017. Republicans' and Democrats' views of the economy have consistently differed over the years, depending on which party controls the White House. With a Democrat in office, Democrats are most positive, while Republicans are most upbeat when a Republican president is in office. The size of this partisan gap varies from year to year. Partisan differences in economic confidence followed similar trajectories in the months leading up to the presidential elections of 2004, 2012 and 2016. In each case, adults who identified with the president's political party grew more confident while members of the opposing party became less confident, expanding the partisan gap. In 2008, the economic recession and global economic crisis disrupted this pattern, both parties' levels of confidence sank, and the gap shrank. More recently, the monthly average trend reveals that the difference in the two major political parties' ECI scores expanded in late 2017, reaching 88 points in December. This is similar to the monthly peaks recorded in late 2005 and late 2006 -- the latter of which coincided with a change of party control of both houses of Congress in the 2006 midterm elections. Democrats and Republicans differ more in the economic outlook component of the ECI than they do in their assessments of the economy's current state, and have for most of Gallup's tracking. When one reviews differences in 2001-2017 annual averages between those who claim allegiance to the two major parties, in just one year -- 2008 -- did the current conditions component of the index yield larger partisan differences than the economic outlook. The average differences between Democrats' and Republicans' assessments of the economy's current conditions have been steady in recent years -- the 33-point difference in 2017 was on par with the 31- to 38-point range found since 2012. 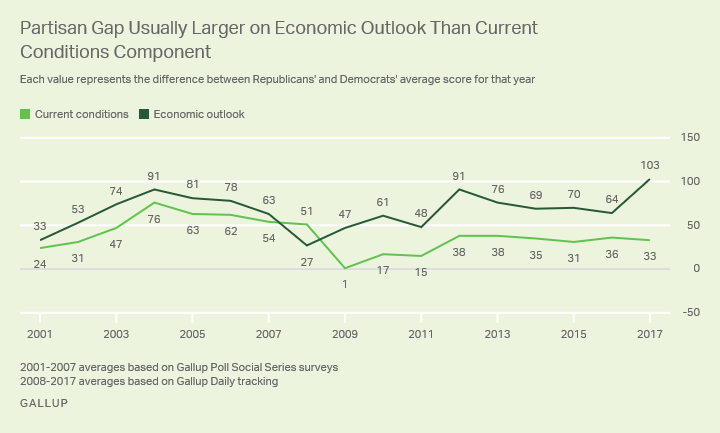 On the other hand, the average partisan difference in the economic outlook component was much larger last year than in any year Gallup has measured since 2001. The 103-point average difference for this component in 2017, a nonelection year, was larger than the previous high of 91 points recorded in the election years of 2004 and 2012. Republicans' economic outlook score averaged +59 in 2017, while Democrats' averaged -44. More specifically, on average in 2017, 77% of Republicans said the economy was "getting better." Meanwhile, the majority of Democrats gave the opposite answer last year, with 69% saying it was "getting worse." Some of this may reflect heightened party polarization in presidential approval ratings under President Donald Trump. Gallup has found a growing divide in how Democrats and Republicans answer questions on issues such as immigration and the environment, as well as their levels of satisfaction with and confidence in certain institutions. Likewise, Americans' assessments of the U.S. economy have become more polarized along party lines. 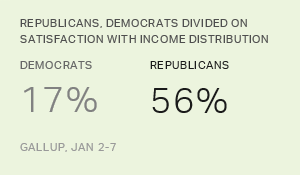 These partisan views of the economy appear to be relatively unaffected by objective economic measures. Republicans' negative views of the economy barely moved over the course of President Barack Obama's presidency, despite gradual improvements in the economy during that time, and the same is true for Democrats now that Trump is in office. Though the U.S. economy has improved in key, demonstrable ways this year, the two major parties have diverged in their assessments of its health to a larger degree than usual in non-presidential election years. The partisan differences were particularly stark regarding optimism about the economy's future in 2017. The vast party differences in views of the economy likely reflect the polarized approval ratings of the president's performance along party lines; Trump's ratings as a first-year president are the most polarized to date. Some of this could also be attributed to the major differences between how the parties get their news, including about the economy, and whether they believe it is accurate. Results for this Gallup poll are based on telephone interviews conducted in 2017, on the Gallup U.S. Daily survey, with a random sample of 45,907 Republicans and 47,451 Democrats aged 18 and older, living in all 50 U.S. states and the District of Columbia. For results based on the total sample of national adults, the margin of sampling error is ±1 percentage points at the 95% confidence level. All reported margins of sampling error include computed design effects for weighting.